It's hard to believe but the week has already flown past, and we now live in a new, post-docathon world. Little did we realize the paucity of documentation that we once had, and the cornucopia of new examples, tutorials, and docstrings that now exist in the open-source world. OK maybe that's a little dramatic, but I'm super impressed with all of the great work that people did over the course of this week. Whether it was migrating documentation over to Sphinx, creating beautiful sphinx galleries to show off visualizations, or launching that new project website, I want to thank everybody for pitching in and being part of the first docathon! First things first, aere's what our activity looked like for the week. I increased the time span beforehand so that we can get a better look at the context for this amount of activity. That's, like, a thousand times more documentation than there was before this week. How awesome is that? And a big thanks to our participants! If you want to continue the party! If you want to continue connecting with fellow documenters out there, we're going to open up a channel in the Write the Docs slack room. It'll be a great way to connect with the broader documentation community. You can also always shoot us a tweet @docathon, or open an issue on our repo. Once again - thanks so much for participating in the docathon this year. We hope that you enjoyed it, and that you or your project can be a little bit prouder of your documentation now that it's over. We're excited to do it again soon! You know that story about the tortoise and the hare? Where the slow, methodical approach of the tortoise ultimately overcomes the fast but inconsistent progress of the hare? Well there is a little-known second chapter to that story, where the tortoise manages to develop cloaking technology such that it is rendered invisible to the hare. As the hare nears the finish line the tortoise lowers its invisibility shield, revealing that it had actually been cruising along on its own little jetpack the whole time. Well that's basically what happened today with the docathon. While pycortex was enjoying an early victory, galaxy-hub decided to show up to the stats board (note: this definitely, assuredly, totally obviously did not have anything to do with a bug that I wrote into the stats plotting function). There are a few new projects that have shown some great progress in the last day! First of all is the aforementioned galaxy hub, which is an open platform for biomedical computation. Next up is pandas, everybody's favorite data wrangling, munging, and pseudo-databasing tool. Finally we have a newcomer to the open-source world, as diy recently unveiled itself to the world as a package for parallel computing, like a butterfly out of the cocoon. OK I'm not even going to mention r-b-g-b, who has apparently done nothing but drink red bull and document code for the last 3 days. For the users who are not superhuman, we should give a shout out to mrzv, ketch, and spopham for giving us a day 4 bump. I can't believe it's almost over! I'm amazed at all the great improvements that I've seen over the last few days. 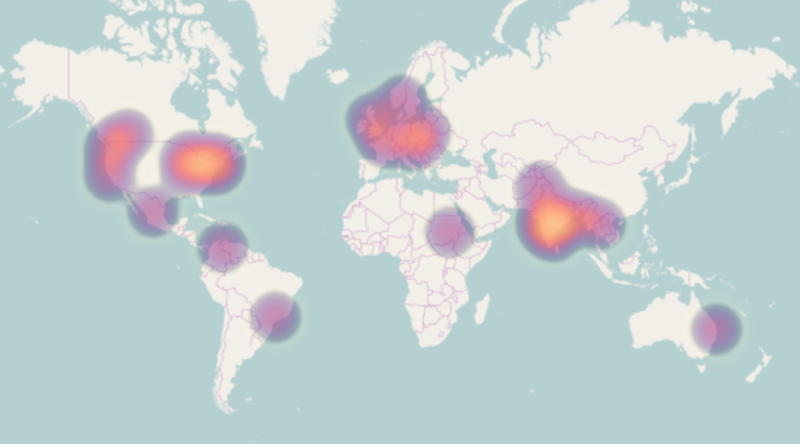 Let's finish strong with a flurry of commits the likes of which the world has never seen before! Every civilization has its heroes. Some are soldiers, politicians, teachers, mentors. And some are documentors. Today we celebrate the heroes of documentation (well, of the last 24 hours anyway). Firstly we celebrate pycortex, which has maintained a documentation streak not seen since the great Steve McDoccerson back in the late 80s. Way to go pycortex! We also celebrate the unsung heroes. Not because they do not do amazing work, but because they...do not use Github. Sadly our scrapers aren't working with non-github projects, but that hasn't stopped yt from converting all of their documentation to sphinx-gallery during the docathon. Finally, we celebrate those who are halfway they - AKA, all of you! 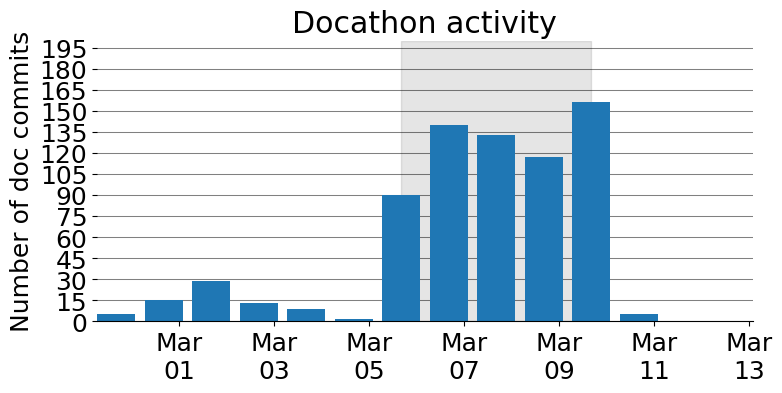 We're nearing the end of Day 03 of the first docathon, and I'm amazed at what people have put together already. Truly, you are all the heroes that we deserve. We are keeping up the pace! Let's keep it going for two more days! 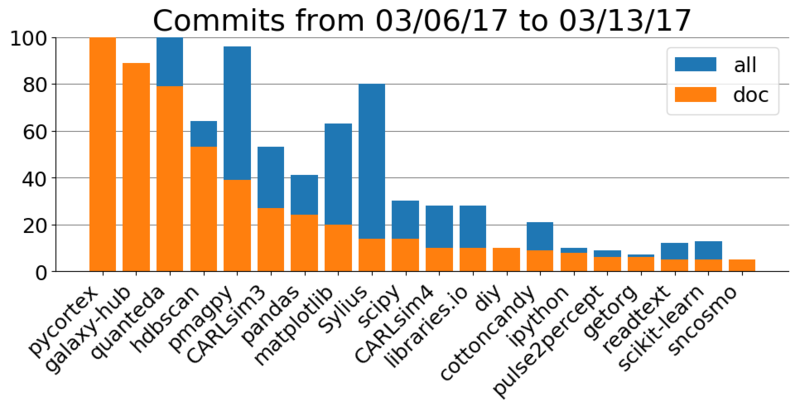 It almost goes without saying at this point, but pycortex has maintained its superhuman documenting pace. Will they ever slow down?! We also wanna give a shout out to matplotlib which is making the noble effort to create a sphinx gallery, as well as quanteda which wins the prize for "awesomest documentation in R package so far" Yeah! Congrats to r-b-g-b, alexhuth, and lmcinnes. Keep up the momentum as we head into the home stretch of the docathon! And don't forget to get those PRs merged sooner than later, so that they show up on the docaboards. Looking forward to finishing strong and seeing what you all come up with!